We love kids! Dr. Ng has worked with children between the ages of 6 months and 17 years, and she excels at making your child feel comfortable and you (the parent) feel confident that they are getting the proper care. LIC Dental Associates has a special pediatric reception area for little ones and their parents. 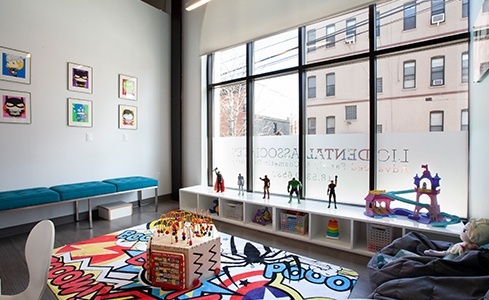 We also have a dedicated pediatric dental room that is customized in a superhero theme just for children! The short answer is "first visit by first birthday." That's the view of the American Academy of Pediatric Dentistry. Pediatricians agree. 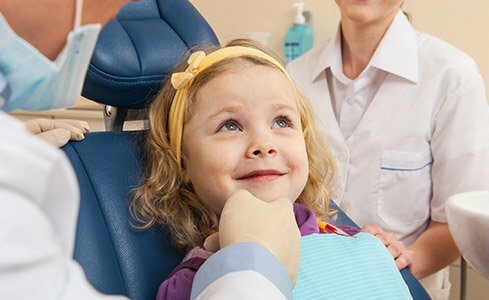 The American Dental Association and the American Academy of Pediatric Dentistry say that the first dental visit should occur within six months after the baby's first tooth appears, but no later than the child's first birthday. It's best to meet the dentist when your child is having no dental problems—don't wait until an emergency comes up. To prevent early childhood cavities, parents first have to find out their child's risk of developing cavities. They also need to learn how to manage diet, hygiene habits, and fluoride exposure to prevent problems. After this first visit, Dr. Ng will suggest a schedule of follow-up visits. As your child grows, our dental team can help you learn how to prevent common oral problems.